In the mid-2000s, the BlackBerry dominated handheld computing. That was before the iPhone was introduced in 2007. Then began an era when slick touchscreen smartphones with fast browsers and gobs of apps commanded the market, led by Apple and Samsung. In the past three years, BlackBerry has struggled. Despite a devoted global base of 275 million enterprise users who want bullet-proof security on their BlackBerry Bolds and other models with hardware keyboards, BlackBerry slipped almost to obscurity. The KEYone hasÂ 52 hardware keys that can double as shortcuts to functions. For instance, the pressing the letter "F" could open to Facebook. Last year, BlackBerry formally threw in the hardware towel and licensed TCL Communication of China to produce its smartphones. That move gave BlackBerry a clear path for focusing on its software and security tools. Isn't BlackBerry too far out of it to ever be viable again? BlackBerry is now well out of the top five smartphone makers, as a host of Asian phone makers have challenged Samsung and Apple, according to market research firm IDC. In the first quarter of 2017, BlackBerry had less than a 1% market share, compared to 23% for Samsung and 15% for Apple, with Huawei (10%), Oppo (7%) and Vivo (5%) in the next three spots. Why would anybody think TCL/BlackBerry could even be a contender? Analysts don't consider TCL/BlackBerry a contender, yet, at least not in the Marlon Brando sense of smartphone competition. Far from it. But TCL North America President Steve Cistulli has set the bar high. He wants the U.S. smartphone market share for BlackBerry to reach 3% by 2020, up from 1%, and to reach 8% to 10% in Canada, up from 5%. Is Cistulli serious? Yes, Cistulli is serious. One reason is that BlackBerry already has a solid brand, especially in many countries outside the U.S. He said the KEYone will be attractive to many of the 275 million older users of BlackBerry devices who like a hardware keyboard and want to upgrade to a newer model. India and Malaysia are especially strong areas for BlackBerry and BlackBerry Messenger, analysts said. The BlackBerry brand is still so solid in the enterprise market that TCL would never want to change the smartphone brand name to TCL. Wait, is it going to be a TCL phone or a BlackBerry phone? And what is TCL anyway? The new phone is called BlackBerry KEYone, so that's clear enough. TCL Corp., the parent of TCL Communication, and its subsidiaries make television sets sold in the U.S., along with a raft of other consumer products ranging from air conditioners to washing machines. There are also subsidiaries that make computer displays and other electronics. TCL Communication also makes low-cost Alcatel smartphones. "TCL Communication has grown to be a top-five smartphone [manufacturer] in North America by focusing on delivering great quality and value and this remains true with our BlackBerry Mobile devices â beginning with the BlackBerry KEYone," Cistulli said in an email statement to Computerworld. What are BlackBerry's chances of attaining renewed glory? Slim, according to two analysts who have followed BlackBerry for years. "To get from 1% to 3% in the U.S. market, TCL would have to sell three times as many devices as they think they can," said Jack Gold, an analyst at J. Gold Associates. "KEYone will have to be an exceptional Android device that would get the market excited," he added. "If it's just a me-too Android device, then it will be an uphill battle." Gold said he does understand there can be pent-up demand for a touchscreen combined with a hardware keyboard among the millions of current BlackBerry users. "There are lots of BlackBerry devices out there that can probably be updated to a new device. KEYone might help TCL in getting upgrades." Marketing the devices properly will be key to the company's success, Gold said. IDC analyst Bryan Bassett agreed. "Reaching 3% in the U.S. by 2020 is an admirable goal. It's unlikely they'll reach it, but not unrealistic." 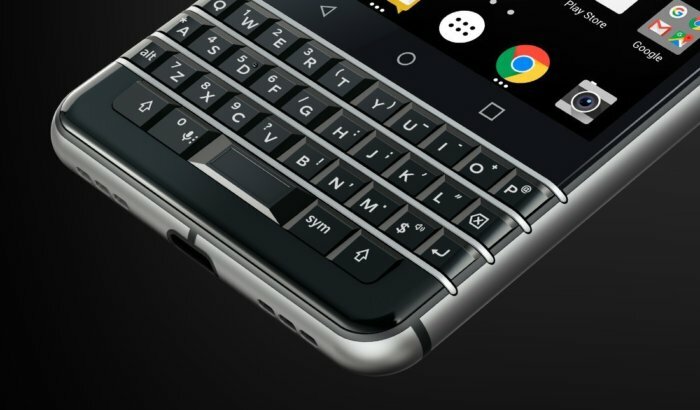 Bassett said it won't be enough for BlackBerry/TCL to focus on enterprise customers who love a hardware keyboard. "They have to stimulate some sort of consumer demand," he said. "In its heyday, BlackBerry was known for its smartphone enterprise tools and email, but now that model has been upended and now consumers have the greater influence," Bassett added. "You really do need the consumer." One thing working against TCL even among enterprise customers is how many have already moved away from BlackBerry to buy a topflight Android device from Samsung, or another vendor, or to an iPhone. "That mature enterprise audience has gone over to Android or iPhone and will be hard-pressed to switch back to BlackBerry," Bassett said. Even though the KEYone is an Android 7.1 (Nougat) device, it may not be perceived that way. What are reviewers saying about the KEYone? Formal reviews on the KEYone will be released Thursday, but a couple of reviewers unofficially have said they like it. Like any new phone, there will be pluses and minuses. When the phone was first unveiled in February at Mobile World Congress, some journalists were openly critical of it, noting that the four rows of hardware keys seemed crammed together. TCL officials at the event said that the keys are no smaller than in previous BlackBerry models, however. Bassett said the specifications suggest the device has features that put it in the "middle of the field" of features found in other top-tier phones. It comes with with a speedy SnapDragon 625 processor and a 3,505 mAh battery that can be charged halfway in 36 minutes. There is a 12-megapixel rear camera and an 8-megapixel front camera, which puts the rear camera behind some high-end consumer phones. One of the biggest new features could please productivity-minded enterprise users. Each of the 52 hardware keys can double as a shortcut to a function. The "F" key can be touched to open Facebook, for instance. Features known by recent BlackBerry fans, like the Hub and DTEK, now in its third version, could entice enterprise users who want newer hardware. DTEKis a tool that lets a user quickly check if apps are meeting the security permissions a user has authorized, while Hub groups apps and services together as users want. The phone will sell for $549. What happens after the KEYone? Considering that recent BlackBerry smartphones, pre-TCL, haven't caught the enterprise market on fire, it would be fair to say that the KEYone will need to be a hit to help TCL gain market traction. If the KEYone is not a major hit, but is not a bomb either, TCL can be expected to produce more smartphones for BlackBerry. Any timetable is unclear.